Spring means fresh foods. Simply prepared and sometimes highly portable. Can’t go wrong with an artichoke. Here’s how I grew up choosing, preparing and eating them. Select an artichoke whose leaves are still tightly closed. I don’t know if this is an old wives’ tale, but I find them to be fresher when they are more compact looking. Chop off the stem and cut a shallow “X” in the base with a knife. With a sharp chef’s knife or serrated version, chop off about an inch of the top so that it is flat. Invert it and place it stem side up over a steamer in about two inches of water. Cover and steam for 45 minutes or until it is fork tender when prodded about the “X” you cut into the stem. Flip it right side up in a bowl, bring along another bowl in which to discard the leaves. To eat: pull off a leaf and scrape the soft part over your teeth. Yum. You may prepare a dip of melted butter and Worcestershire sauce in which to dip the leaves and eventually soak the heart. When all the leaves have been nibbled upon, you are left with a thin layer of pale cream and purple leaves. This crown may also be nibbled on very delicately around the edges. There you are facing the choke — the hair like filaments. Separate them from the heart using a spoon, and discard. Chop the heart into the sauce and have at it. Some like to serve artichokes cold with a mayonnaise and garlic dip or a traditional aioli (garlic, salt, egg and olive oil) works very well. This is a conversation piece of an appetizer at a picnic. 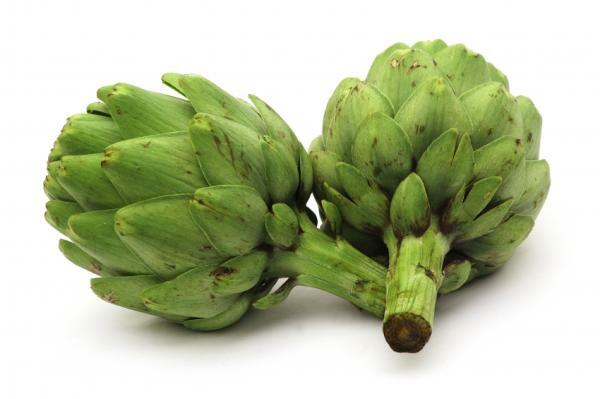 Very small, new artichokes may be split in half and sautéed in olive oil, garlic and salt for a truly delicious starting course. Any way you choose to have them, serve with champagne. Because everything goes nicely with champagne. This entry was posted in Entertaining and tagged Entertaining, Living, recipes. Bookmark the permalink. I love artichokes and especially that yummy artichoke dip, but this was a bit too much for me. Oh yum…it’s been far too long since I’ve prepared fresh artichokes. I think I just may need to do something about that! I, too, love a good articoke. My husband does a great job with grilling them a bit with olive oil after steaming or boiling. Although, I have yet to find a beverage that does not taste different after eating them? http://en.wikipedia.org/wiki/Cynar An Italian artichoke and herb liqueur. Hmmm, Cynar sounds like something one should mix with soda water. And wouldn’t that be a bit like the Vietnamese artichoke soda? Gahhh. Reggie, That sounds very good, even to my poor recovering stomach. Thanks for the tip. Katiedid, there is that problem. I think it helps to choose wines which compliment the taste. Artichokes make wine taste sweeter. You want a very dry something. And avoid red, highly tannic wines. Try a Brouilly. A fino or manzanilla sherry with the hearts goes very well, too. Aesthete, please do, anything to help along the cheap stuff which is sometimes all that’s left in the wine refrigerator! Artichokes are hands-down my favorite vegetable. I just returned from Asia Minor whare I witnessed a vendor standing next to a wooden cart piled high with fresh green artichokes. I watched as this man cleaned away the leaves and thistles removing the stem last. He tossed the remaining heart into a nearby box. Later that evening, I dined on boiled artichoke hearts stuffed with feta, sauted spinich and sun dried tomatoes. It was Delicious. Brilliant, I think I have a new summer recipe. Thanks Arc! And welcome back Stateside.